Best Western Oasis Inn est idéalement situé dans le centre de Canadian. Venez découvrir et profiter de notre hôtel à côté des principaux sites touristiques. Réservation au meilleur prix et offres exclusives toute l'année. Bienvenue dans notre hôtel Best Western de Canadian, au Texas ! Il bénéficie d'une situation centrale à proximité des principales industries du pétrole et du gaz des comtés de Hemphill et Lipscomb. Idéalement situé, à la sortie de la Highway 60, dans le comté de Hemphill, notre hôtel de Canadian, au Texas, offre aux voyageurs d'affaires aussi bien qu'aux touristes le meilleur en matière de service clients et d'hébergement. Chaque chambre agréablement aménagée est équipée d'un four à micro-ondes, réfrigérateur, télévision LCD 81 cm avec câble et Internet haut débit sans fil gratuit. Les voyageurs d'affaires et les touristes apprécieront le centre d'affaires et la salle de réunion/conférence pour leurs réunions d'entreprise ou de famille. Cet hôtel de Canadian, au Texas, dispose également d'une piscine intérieure chauffée et d'un centre de fitness et offre un petit déjeuner continental gratuit. Cet hôtel est le lieu de séjour idéal pour les voyageurs souhaitant assister aux rodéos, festivals et autres manifestations de la région. Le Best Western Oasis Inn est à moins de deux kilomètres du Palace Theatre. Cet hôtel de Canadian, au Texas, est également proche du Black Kettle National Grassland Park. Les voyageurs d'affaires séjournant à cet hôtel de Canadian seront à proximité de plusieurs entreprises de pétrole et gaz. Le Best Western Oasis Inn vous offre un service clients de qualité supérieure et une situation pratique à Canadian. Réservez votre chambre et faites des économies ! Passez un excellent séjour ! I put the "Do not Disturb" sign on door for the first night, but removed it as I left room on Saturday morning about 10 a.m.. Problem #1 >> Room was never cleaned. Shower leaked, so floor was standing in puddle, no toilet paper, no tissues. Problem #2 >> Sign by Elevator, 3rd floor says: DO use this elevator in case of Fire. The "not" letters/word fell off the sign. Problem #3 >> Some people like me don't drink coffee. Put some tea bags in the room by the coffee maker. Problem #4: The sag in the mattress goes away somewhat if you shove a pillow under the mattress, like I did. We came to town for the day to see the beautiful fall colors and decided to then stay for the night to experience the small-town spirit. Needless to say the front desk did not express the small-town spirit during checkout. The front desk girl called around 1020 asking if we were going to check out and I said yes we are checking out for the day, she then proceeded to tell me that check out is at 11 I asked if we could extend that for an hour since we checked in late and she simply said “nope”without explaining any further the reasons why and said goodbye. There wasn't any warm fuzzy feeling from the small town spirit that I had just experienced during the day before and I feel like customer service failed to please. It didn't matter if they were booked for the week, which I would've understood the need to leave but i felt that she was so short and dry. I could've taken my $150 somewhere else for only 11 hours of stay, and be treated with kindness. Needless to say I don't think I'll be coming back. And I'm referring to the Best Western and not. Canadian. The staff is very friendly and the accommodations were very nice. The experience was one I'll never forget. If you ever find yourself in Canadian , TX stay at the Best Western. It will be the best decision you could make. The room was clean, great location, but on my last day before I checked out, housekeeping went into the room and threw away my medicine and stripped the beds and took all the towels. I will not stay here again. Stayed here on March 11th, what a great place. 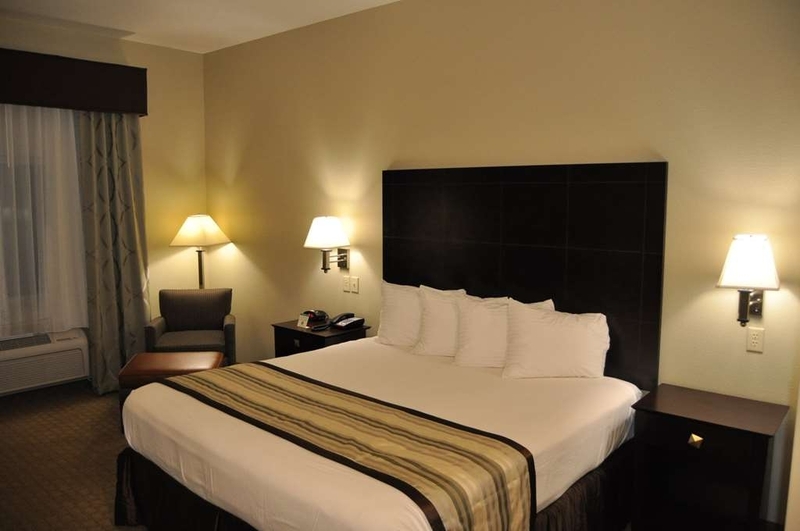 The staff was wonderful, the room was clean and well appointed. Got a great suggestion from the front desk about where to eat. We could not have asked for a better place to stay! We at the Best Western Oasis Inn thank you for choosing our hotel. It was an honor and our pleasure serving you! We hope to see you agian in the future. Thank you for the compliments Best Western Oasis staff takes pride in the work in customer service. Thank you for recommending out hotel! "Best place to stay in Canadian"
I stayed here for work, it's very clean, very quiet and just what you'd expect from a Best Western. Its quiet for being so close to the highway. The breakfast was great, the parking lost is a little small, I wouldn't recommend if you have a camper or trailer or anything. This is oil field country so be prepared, the rates were high. There is a nice little restaurant next door that serves burgers and beer and a Pizza hut across the street. Thank you for choosing Best Western Oasis Inn! We appreciate your business. We stayed for a wedding in the area. Enjoyed our nice cool room. Staff was friendly and professional. Although we didn't enjoy the breakfast area it seemed to be quite busy even for a Sunday morning. We will stay here again when in this area. We appreciate your business, I hope we can further accomidate future weddings in your family! "An oasis in the Texas Panhandle"
The staff was friendly and very welcoming, making sure all our needs were met. The rooms were very clean and well cared for. The air conditioning was on in our rooms when we arrived on a very hot day, so we were very comfortable. The proprietor, Mr. Patel, was amazing! Thank you for choosing Best Western Oasis Inn! We hope to see you soon again and make your stay as pleasant as the first time. Very nice stop. Room was clean. Beds were comfy. Staff was nice. I felt it was a little pricey but we were desperate and exhausted so we took it. Breakfast was good, and very thankful that it started at 5AM since we had to get back on the road so early. This was my second stay at this property and very likely could have been one of at least ten in the coming weeks for work. My first stay was nice. The front desk was courteous the room, while very basic and worn was comfortable. Based on that I chose to stay for a second night. The owner checked me in and was very abrupt. No small talk but a lot of back and forth about his rules. Not sure if he has issues with people tearing up his property or cooking in the rooms but I'm certain I don't fit the profile. I left it that Mr. Owner was having a bad day. My team members also said his co-owner said the same things when we met in the lobby later to review a presentation. A presentation which he interrupted twice. A group of oil workers were in the lobby prior to us and had left some trash at their table. Again, not sure if he thought three guys in khakis with a computer and a boring power-point were tossing back Bud Lights. That said, he made a very loud point while I was packing my computer to tell the front desk clerk to rudely, "wipe the table after they leave." The kicker and the main reason I will not stay at this property and gave them a. One star has to do with my check out. I left a few minutes before the 11:00AM check out. I was working in the room and on calls the entire morning. I was interrupted twice by the cleaning staff. I did not have a chance to go to the lobby for breakfast. The hotel advertises on the counter that they have grab and go breakfasts. I asked the co-owner if I could get one. Instead of reaching behind her and grabbing one, she said they didn't have any. When I pointed to them she said rudely, "breakfast was over." I asked if I should stay elsewhere next time I was in town? Mrs. Owner said, "Please, you saw the rules when you checked in." I'm not sure what rule she was referring to but I did see the sign advertising a grab and go breakfast. In the end this property will lose the business of my team because a short sighted owner couldn't compare the unit price of a bottle of water and a cereal bar against potential months of nights of business. Is this property the worst I've stayed in? No, but it does not warrant repeat visits and my advice is drive down the road. Best place to stay in Canadian. Close to everything downtown and the hotel is very clean. The staff was very friendly and helpful. The train coming through town makes alot of noise but that is to be expected when you visit Canadian. I checked in after working 6 straight days with very little sleep, wanted to sleep a little longer to catch up on rest. At 8 am i heard the housekeeping vacuum fire up and run for about 10 minutes, shortly after i heard the housekeeping staff laughing and talking loudly outside my room. I will not pay $130 dollars to stay at this motel again. This Hotel was extremely clean and the staff was very friendly. The manager told us about the events going on in town that weekend. I would highly recommend it to anyone traveling thru the panhandle of Texas. "Great Service in NoWhere, TX"
"Awesome Choice for an awesome town"
Went here on business, liked it so much we are planning a family trip! Would recommend this Best Western to anyone, if you stay their ask for staff recommendations on places to eat...you WILL NOT be disappointed!! The wife and I just checking things out in this nice town. Out in the middle of BFE but we heard so many nice things about it. Great stay here. Clean hotel with very nice mgr/owner. He sat with me during breakfast and chatted. I didn't care much for the prepackaged sandwiches but that's just me. Coffee hot yummy oatmeal bar all is good. Pics below is of boot cleaner only in Texas! Oil field guys get really muddy! Back to my home town for niece's wedding. Asked her mom for best lodging in town, and she said Best Western. Hotel was clean and comfortable, very nice. Only drawback was only one attempt at housekeeping per day. I think this is the best hotel in town. Very nice place to stay in Canadian, Texas. Nice rooms, clean rooms, great service with convienent location. Become a BW Rewards member. Large rooms, comfortable with large TV. Multiple dining options within waking distance. We enjoyed the hotel except for those horrible pillows. They absolutely had zero batting/filling. I folded the 2 pillows on my side & still had NO support for my head. We enjoyed the soap, shampoo and lotion dispensers in the bathroom. If you are in the area, this is the ONLY place you should consider staying at. Great hotel! Clean, friendly, and the nicest hotel around. The owners take pride in making this hotel the best in the area. "Worst hotel stay in my life"
This has by far been the worst travel experience I have had. We have had prior issues with the property manager but let it go due to limited other options in this small town. Tonight was BAD... the manager is kicking my family out, I have a 2 and 5 year old by the way, on THANKSGIVING DAY. It all started due to our room not having a working refrigerator. The front desk employee said she was new and couldn't move us to a new room or call the manager as he would yell at her, or call maintenance since they had already left. I told her I had two young children and just bought frozen food items and we needed something done quicker. She said that she would call the manager in about an hour. I asked her if the food went bad before the manager responded or the fridge was fixed would the hotel cover the food waste. She said no, so I told her to contact her manager immediately and he could yell at me if he wanted. A few minutes later the front desk called to let us know we would be getting a new room, a few hours later at 8:30 PM the manager called our room (waking up my two year old) and proceeded to yell and belittle me for "cursing" at his employee and that I should be ashamed of myself. I told him that I used no such language and to pull his security footage, he then got defensive and informed me that he would be kicking my family out the next morning. (Thanksgiving day) We have had double billing issues and attitude problems from this manager before but let it go since there aren't a lot of options in this small town. Look at other reviews and anybody that has had an interaction w/ the manager has left with the same experience. Do yourself a favor and find a way to stay elsewhere. I'm sorry you feel this way. we gave you another room and you stated the room was ok. the thing we didn't appreciate was the foul language used toward the employee working front desk. you decided to check out we did not make you check out. "Met my expectations. Good breakfast. Perfect location." This was the best place to stay. It's right next to the Stumblin Goat Saloon which is next to another good restaurant. Across the street is Pizza Hut. Diagonally across the intersection is the town's largest grocery store--Lowe's. The hotel itself is clean, well managed, and just what I expect in a Best Western. I had no complaints. The breakfast was very good and the staff, friendly and helpful when I asked about information on the Fall Foliage Festival and things to do in town. "Great Staff, Horrible RUDE Owner"
Terri at the front desk was wonderful. Smiling, polite, even directed us to a great steakhouse in town.When I returned from dinner, I was waiting til she got off the phone to thank her, and the owner angrily pointed out "She's on the phone", then glared at me as I tried to wait. I told him to thank her for great service, and his reply was "Whatever" When I came down to smoke several more times, he was there, angry, gruff, glaring...I will NEVER stay in this place again, this review will be posted to any and all sites I can find, and I have forbidden my employees from staying here as well. "Probably the best in the area, if that means much." Its a nice clean place with everything you would expect. They stay pretty busy, but still manage to care about their image. A bit on the expensive side, anyone here not for work will have a hard time. Internet can be a little hit or miss. Nothing special about the place. We were passing through & stayed one night. This motel is SUPER Clean & in very good repair. Everything was nice. The bathroom was very large and the beds were excellent. Canadian Texas is also a fun small town to explore ! Thanks for your comments.. our staff likes it.. Very nice, clean hotel with courteous staff. the breakfast was served starting at 5;00 am which was good, as I was there for business and need to start the day early. 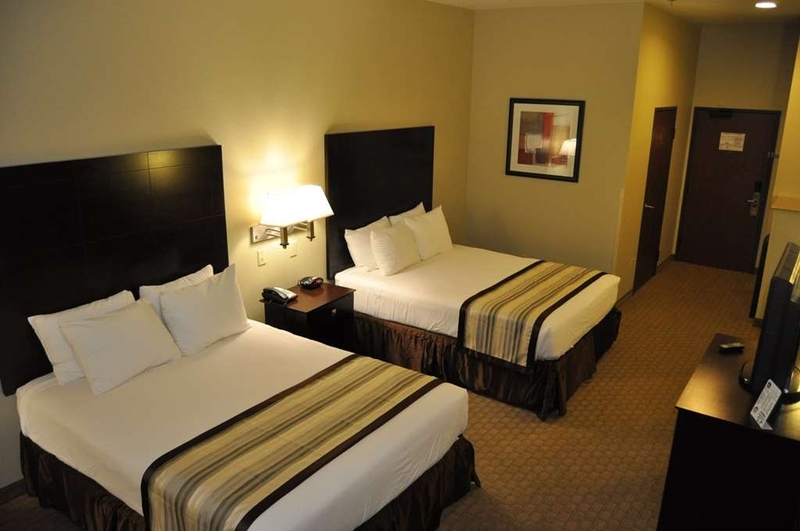 Room was large and very comfortable, adequate parking, and friendly, helpful staff. I would definitely recommend this hotel to anyone. Thank you for choosing the Best Western Inn ..
"Considering you are in rural Texas, this place is nice!" I travel a lot. Mostly to. Rural places. This is a newer hotel in Canadian Texas that serves the oilfield and ranching crowd. Overall, very nice, clean, affordable and friendly. A good complimentary breakfast and the place is quiet. Not bad for "Nowhereville Texas". I enjoyed this hotel very much! I had to make the trip because my mother's health had deteriorated & we decided she would be better off in an assisted living apt. So we had to clean out her home of 40 years, so it can be sold!